I love mussels – they’re a great quick dinner, especially since most supermarkets now carry well-cleaned and de-bearded shellfish. My old books tell you to clean mussels for ages, but these days Whole Foods usually does it for you. All you have to do is toss those babies in a pot and steam them for ten minutes. Almost every one of my “big books” (the doorstops: Gourmet, Mrs. Beeton, the Gold Cook Book) had a recipe for Moules Mariniere , but I was looking for something different…and I found Mussels Apicella in Gourmet. I’ve tried without luck to figure out by Googling what “Apicella” refers to – let me know if you turn anything up! 1. Toss the raw mussels in oil with the garlic, sprigs of parsley, salt, and red pepper. 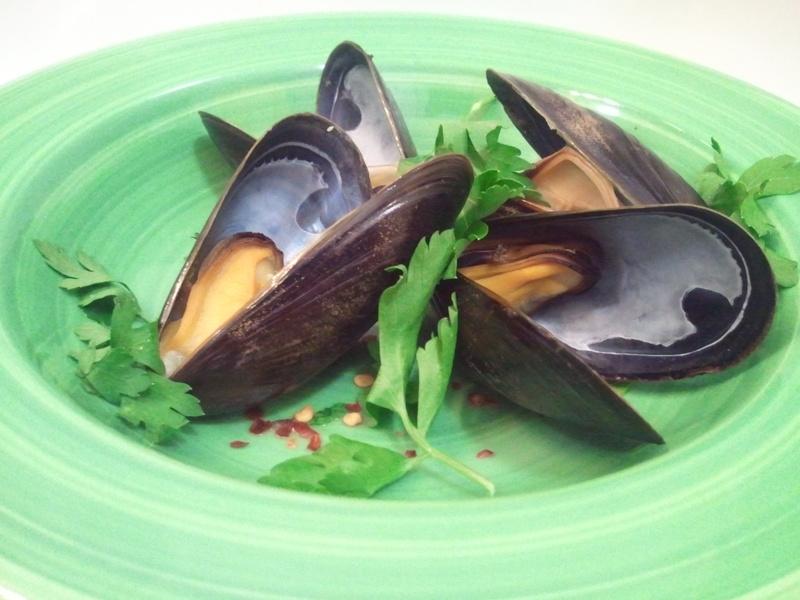 Place over medium flame, add water, and steam for 10 minutes – until the mussels open of their own accord. 2. Sprinkle with reserved raw parsley and serve with bread to mop up mussel juices. So easy! Note on mussels (and shellfish in general): I hate to break it to you, but mussels are alive when you buy them – or they should be. If a few haven’t opened when the others have, don’t try to open them: it usually means they were DOA and are not safe to eat. ooh i love mussels, too! Aaaw, this actually makes me kind of sad. Poor mussels. Poor, delicious mussels. I’m gonna have to try this!!! It’s funny I stumbled upon it because I was looking for genealogy info on my family name apicella!! The name means beekeeper maybe it refers to the sting of the red pepper?? Or maybe an Apicella made it famous somewhere? I discovered this one about 37 years ago when I lived in Stony Brook, NY on the shore of Long Island Sound. We’d go out and collect our mussels at low tide. Once, with one graduate student, ate a bucket of mussels on a pound of linguine (better than bread). Actually the added salt is hardly needed – the mussels come with their own from the ocean.